On Sunday, December 3, 2017, the Kali Parea Ministry of Kimisis Tis Theotokou donated to the Parking Lot Project of Kimisis. 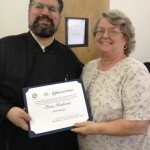 With the goal to raise funds for the new South Lawn Parking Lot, the group was pleased to be the first Church Ministry to offer its donation. It is fitting that this group was the first to step forward as many of its members are founders of Kimisis dating back to 1973. The presentation was made to Steve Bontales, Fundraising Chairman and Demetri Orfanitopoulos, Design and Planning. 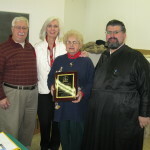 L to R: Demetri Orfanitopoulos, Steve Bontales, Fr. 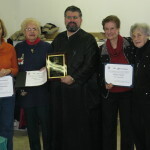 Panagiotis Lekkas, Helen Certa, President Kali Parea, Connie Mellas, former President and now Board Consultant, Anastasia Giannakouras, Treasurer, and Helen Antholis, Board Consultant. We are back to meeting on the first Tuesday of the month in the All Purpose room at 11:30am. 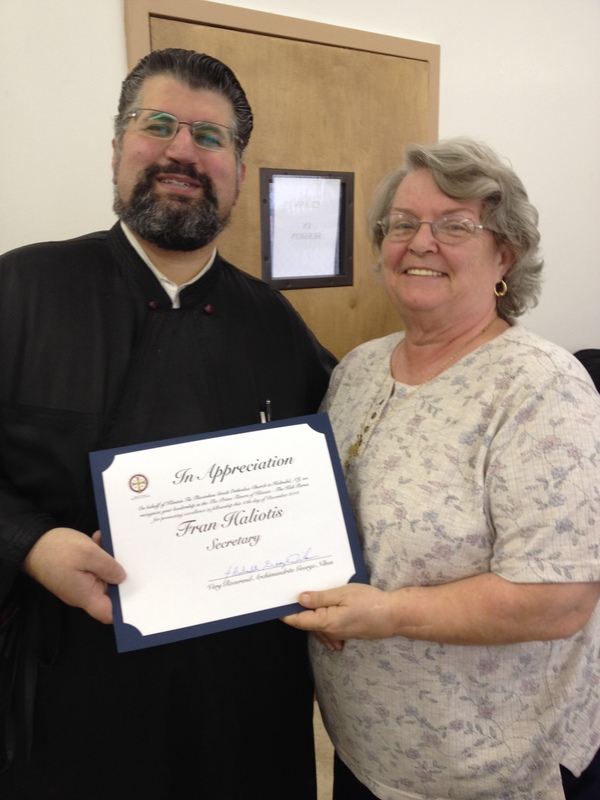 We opened our Ecclesiastical Year on Tuesday, September 18 with a Blessing from Father Panagiotis at “Simply Greek” restautant in Holmdel. We had 25 parishioners attend with for several hours of food and fellowship. Please attend on October 2 and other first Tuesdays. Check out our bulletin board in the Administration Building for updated information. We will host coffee hour on Sunday, Feb. 17. The Kali Parea had an active Spring 2017 season. Whether at monthly meetings or Lenten luncheons, the group of 50 is always ready to assist with the needs of the Church. During Lent, members of the Kali Parea dyed and wrapped 304 eggs for Easter services (see photo; eggs donated by Chris and Loula Stellakis), sang in the Choir (Helen Antholis, Connie Mellas, Savas Charitonides, Donna Sanoudis, Elena Daniele), participated in Palm Sunday preparations by preparing hundreds of palm crosses, decorated the Kouvouklion (see photo), and hosted the Fellowship Hour on April 30 with delicious foods and pastries. 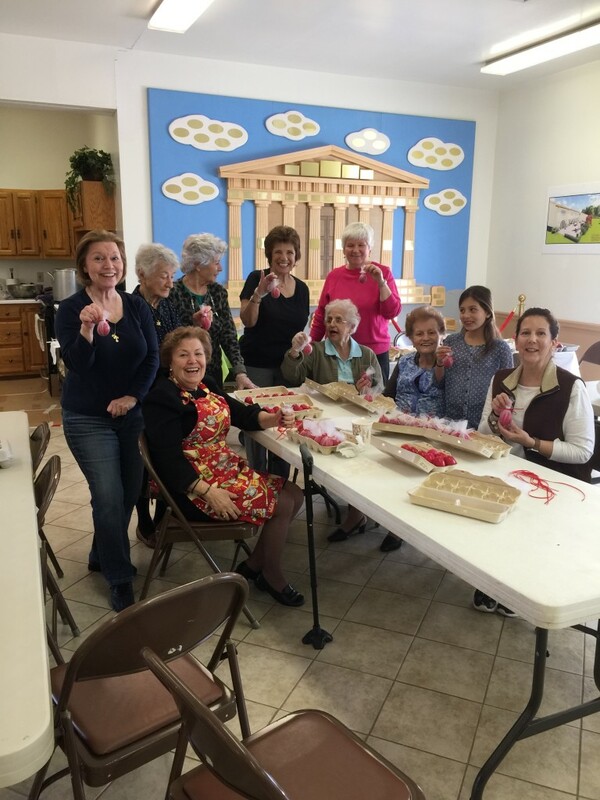 They also participated in the first annual Flea Market and Bake Sale on April 22 by baking pastries and helping to run the Flea Market (Gia Grossenbacher, Elena Daniele, Connie Mellas, Donna Sanoudis, Helen & Ernest Antholis). Attending Church services Sundays and during the week is where you’ll find our Kali Parea members at the Candles Stand (Costa Phillipou, Margarita Actipis Bowden) as well as behind the scenes preparing Prosforo (Harriet Stamatis) and Koliva (Maria Kazanis), and assisting Father in the Altar (Evangelos Kazanis) and at the Chant Stand (Ted Aspiotis). 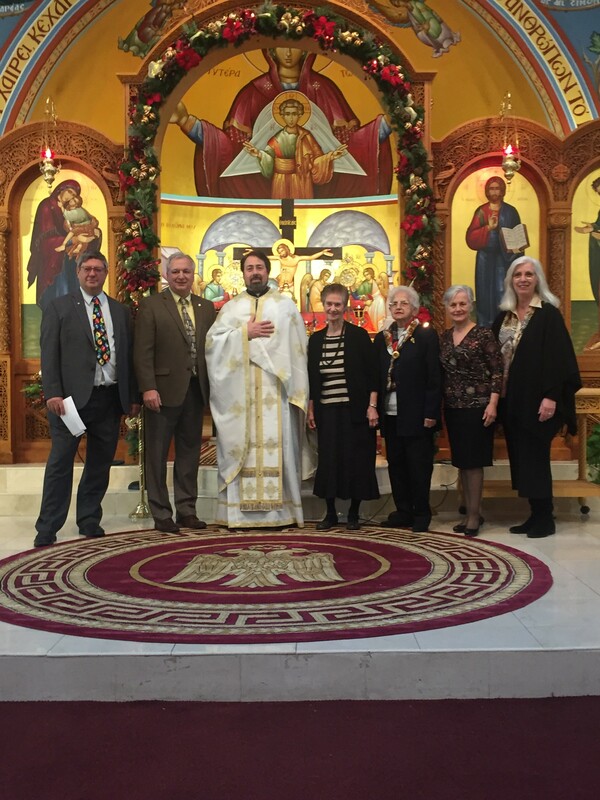 On Fridays during Lent after Church services, many Kali Parea members attended lectures conducted by Father Panagiotis and by parishioners Roula Merianos and Salomi Horvath. Coming up, you’ll find members preparing pastries for the Annual Greek Festival and working in the Kitchen, Admissions, or wherever needed. The end-of-the-year event was the May 2 Luncheon at the Trattoria Rustica in Matawan where 50 members and supporters celebrated the year and birthdays that occurred in May. The restaurant is owned by fellow parishioner and former Parish Council President, George Panagakos, who always treats our group to delicious fare with fabulous service. And First Vice President of our Parish Council, Rosanna Panagakos (George’s daughter), was on hand to help. 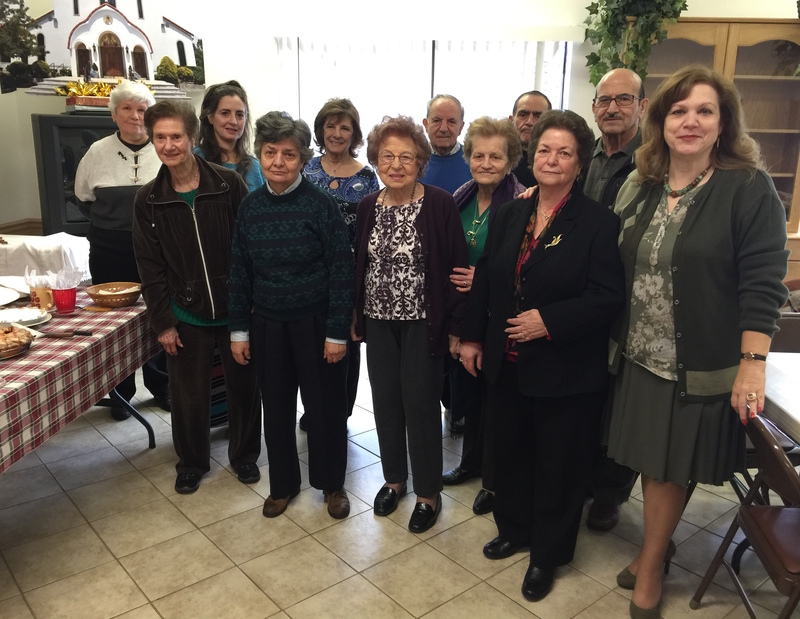 We thank our officers, Helen Certa, President; Liberty Toto, Secretary; and Anastasia Giannakouras, Treasurer along with Helen Antholis and Connie Mellas as Board Consultants, for another successful year. The Kali Parea does not meet in the summer months. The meetings will resume in September, typically on the first Tuesday of the month. Please consult the Church website, Church calendar, Bulletin Board, or Father’s announcements for the upcoming meeting dates and events as the dates may change. See you in September! The Kali Parea is a ministry of Kimisis Stewards who gather for daytime social and fellowship activities. 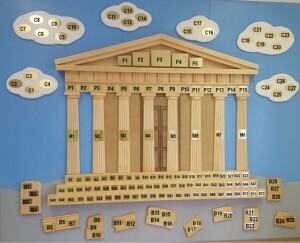 Please view our Bulletin Board for news and upcoming events. The Board is located in the hallway opposite the All Purpose Room in the Administration Building. Meetings: FIRST TUESDAY of the month (except June – August) 11:30 am – All-Purpose Room, Administration Building. In case of inclement weather, contact one the leaders or call 732-739-1515.